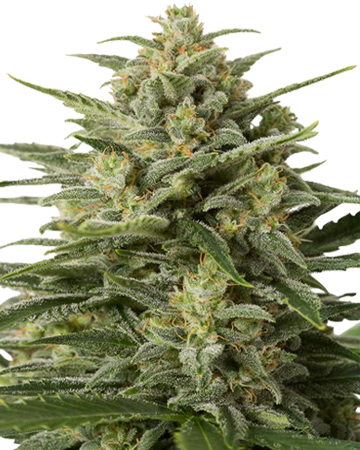 Indica-dominant Blueberry Auto is a hybrid of the original, pure indica strain, and automatic-flowering Ruderalis, a cannabis variety that has adapted to shorter growing seasons by automatically entering the flowering stage after a few weeks. 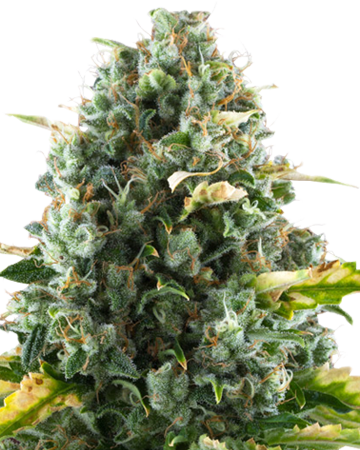 Blueberry Auto-Flowering receives its name from a fruity flavor and scent reminiscent of blueberries which, depending on the user, can paint the world in bright colors, or bring on a deep sleep. 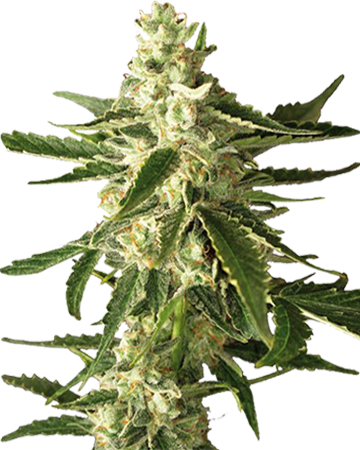 Blueberry cannabis seeds grow into plants that deliver a lot of relaxation, thanks both to high indica content and moderate levels of non-psychoactive cannabidiol (CBD). 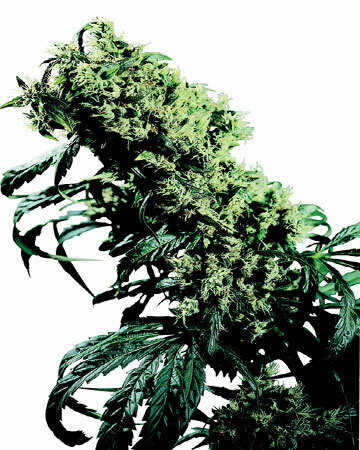 This healthy helping of a non-psychoactive cannabinoid, means users of these cannabis seeds should find less of the mental “high” for which high THC/low CBD strains are known, though with a moderate THC level of 16%, don’t expect to completely bypass these heady effects. At Growers Choice, we also offer our CBD Blueberry cannabis seeds for those seeking even less THC (resulting in minimal/no euphoria). Whether your reaction to Blueberry leaves you feeling super relaxed or happily calm, you should definitely notice some pain relief from this strain. 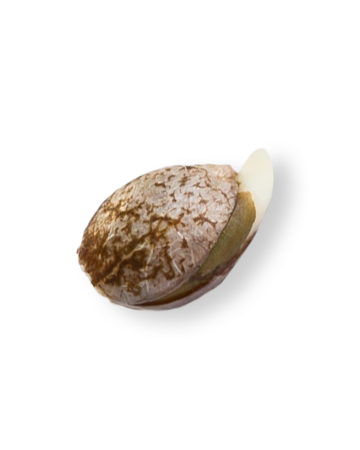 Lie back and enjoy the body stone sensation, and let it soothe the stiffness and ache from tired muscles and joints. 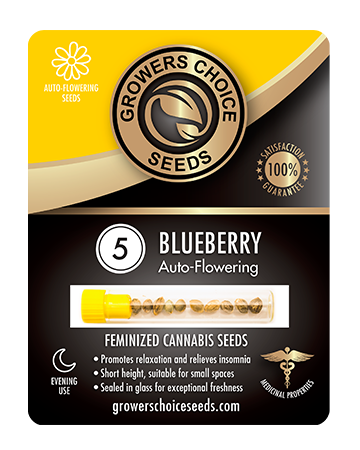 Blueberry cannabis seeds grow up to offer other medical benefits as well: the plant can tackle stress, insomnia, migraines and headaches, and even relieve depression, anxiety, bi-polar disorder, and ADHD. Because the strain is known for being pretty potent, even in small doses, we advise taking it easy until you know how effective Blueberry will be. 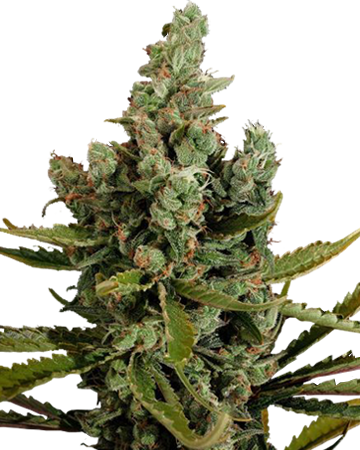 Blueberry Auto-Flowering cannabis seeds are perfectly suited for indoor growing, specifically Screen of Green methods in a hydroponic set-up. 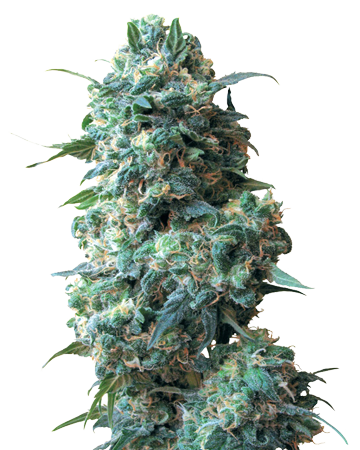 Be aware that your fruity plant might require extra support for all that thick indica resin when flowering. 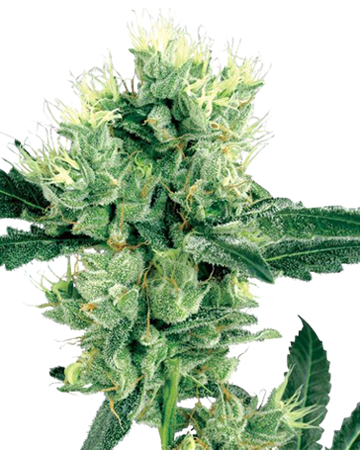 Following eight or nine weeks in the garden, this medicinal pest- and disease-resistant strain will reward you with a large yield of big, beneficial flowers. 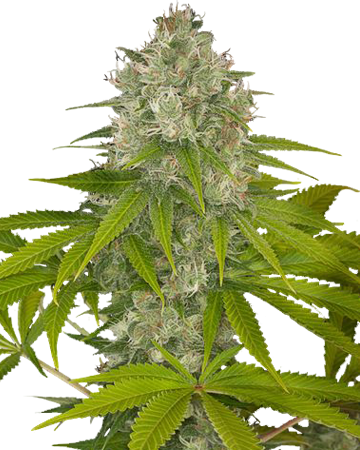 Read our in-depth Blueberry Auto-Flowering Cannabis article for more information on this therapeutic strain! My babies are growing beautifully and I can’t wait to get to harvest. I love watching them grow. They were very easy to germinate. 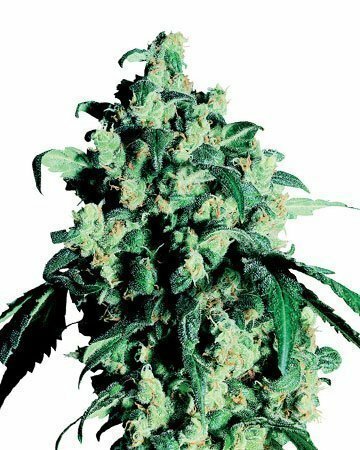 Beautiful plant with massive chunky buds. Grew awesome in sea of green had an awesome fade. My first one didnt fully autoflower but i switched to 13 on 11 off with my lights n she just blew up huge. I am so very pleased with the quality of medicine i get from gcs. Fruity strains are the best and this is no different. Thing is that it can be pretty potent if you smoke too much and I’ve been using this strain for years. I grow them myself organically from the feminized cannabis seeds I buy here so I know it’s not got anything in it. Buy as with everything, moderation. Really great marijuana to have on hand for guests. Plants give you a few ounces, so I only grow about 5 of these plants a year. Was a beast!! Kinda temperamental, but if you take the hints the plant is giving you, then you will do fine. Its hanging right now, should get a few ounces. This one really lives up to its name—from the smell to the taste and it’s look, and it’s actually been a delight to have it growing inside my house. Thankfully Growers Choice is so good with all of its information because I was ready for the heavy resin when it started the plant started flowering. You really get a great harvest with this one, but it might not be the easiest for people who are new to gardening. And I wouldn’t recommend giving this to people who aren’t familiar with cannabis, even if they are with feminized cannabis seeds, on their first go! 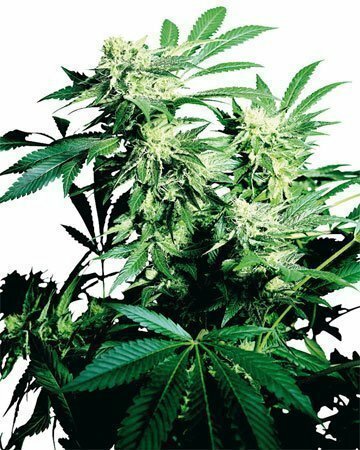 This plant is so pretty I’d probably want to grow it even if there wasn’t any cannabis! Just as the name suggests it’s got a great, subtle blueberry flavor. I love using it the day after a good workout to help relax my stiff muscles. In terms of growing, it might not be the best for beginners, because I got the best results using my hydroponic set-up. I tried one feminized cannabis seed without to see how it would turn out and it definitely didn’t do as well, though the results weren’t bad. These plants are amazing. They grow really nicely, smell great, and taste amazing. 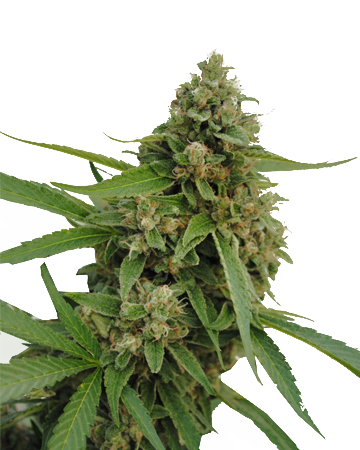 Blueberry feminized cannabis seeds also come as a high CBD version, which is also really great. I grow 2 to 3 plants at a time. Usually I’ll order 3 pot seeds at a time, and most of the time all 3 seeds sprout for me. A couple times only 2 sprouted, but that’s to be expected. 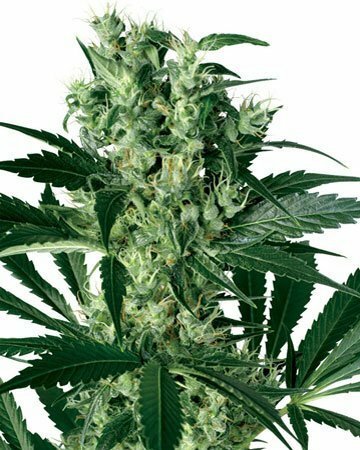 Best place to order good seeds. I literally keep growing this strain because it is so beautiful. The flowers just pop. Plus, it smells fantastic. 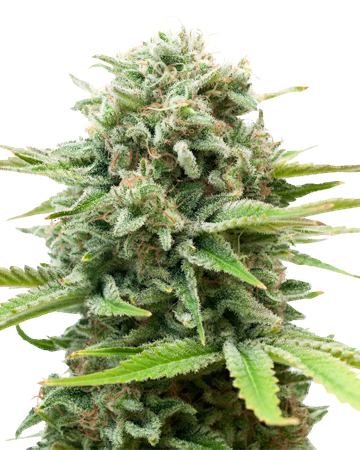 That might be a silly reason… It’s a great plant and a great high, nice at the end of the day or on the weekend. I always try to have some on hand during the winter because it reminds me of summer. I have a little hydroponic set up for about 6 plants, and my Growers Choice seeds usually produce some nice results come harvest time. I’ve found this company to be the most consistent with delivery, too, always on time, haven’t had a single order lost to customs. I was able to grow two plants through to harvest, the other three germinated but failed to grow. I grew them for 12 weeks exactly, in soil, and each plant yielded one ounce of dried buds. I grew them to treat my insomnia and I tried one bud last night and it did a pretty good job. I would describe the high as subtle, a little bit of body stone and a very minor head buzz. I only smoke before bed, ever, so as long as I sleep, which I did, then I am happy with the result. When I order again I will give these another go. If you aren’t a fan of that strong traditional cannabis flavor, you’ll love this stuff and the Tangerine Dream. Both a kind of fruity and mask the taste pretty well. I grew mine indoors and had great yields from both strains. 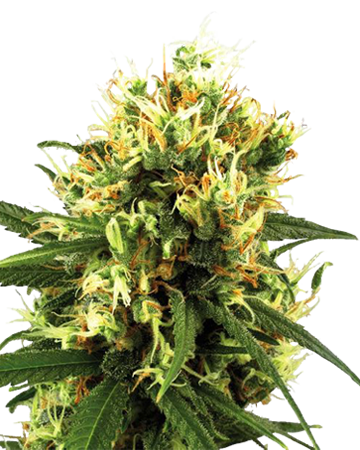 If you’re looking for where to buy feminized cannabis seeds, this place is your best bet because they have a germination guarantee. Will be looking at other strains soon. Having ADHD is pretty popular these days, but it’s hard to keep track of stuff when your brain is all over the place. I’ve been on adderall, Ritalin, daytrana, you name it, and it just makes me a zombie. I also use the CBD blueberry sometimes, but this classic strain is great. I’ve been reading a lot about the sea of green method, and wanted to give it a try. Customer service helped me pick a plant that would grow well under these conditions, and so I went with the blueberry auto flowering seeds. Gotta say, if you want to try out some new methods this a perfect plan to play with. Doing a SoG grow ended up being ideal because the plants stayed fairly small but each one produced a solid little yield. Really pleased with how everything grew and will def. be coming back for more blueberry seeds. Easily 5 stars for the blueberry, for taste, high, and grow. My plants didn’t get tall so much as they got heavy, and that is not bad in my books! Solid yield of some amazing smelling buds, and the taste off these is to die for. I know some people get really tired off blueberry, but I find it just relaxing. Not too strong, and more of a body high than a head high overall. If you’re looking for an all around great smoke, blueberry is the way to go. 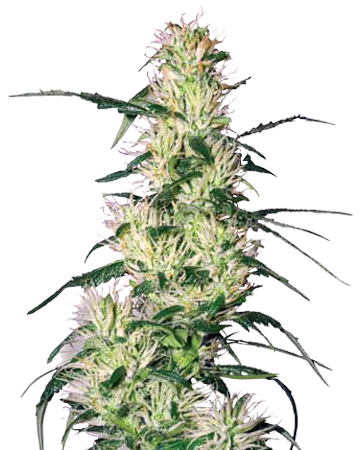 Now that fall is here and winter is creeping up, going for autoflowering seeds is my must. This is the time of year I crank the heat up in the house, and I’d rather keep my electricity bill down a bit with having heat and lights going! That’s the best part of these seeds, no fuss about light schedules, just keep your place nice and toasty and you’ll get them to flower without issue. I’ve tried these seeds before and they are great, so I had to pick up some more now that the seasons are changing. The flavour off this is so good, and I love curling up and smoking a bowl. Great no matter what your tolerance is, and just leaves you feeling comfy and relaxed. The seeds made it to Massachusetts very quickly and the packaging is very nice. I planted 3 seeds and two are doing great and are flowing after about 28 days. One was very slow to make it out of the soil and ended up dead. It probably was my fault, I’m a newbie grower. Out of the 3 strains I have grown before this has taken off the fastest. I can’t wait to try some in a couple of months! Blueberry’s always a winner in my book – a pretty safe bet. These autos were no exception. 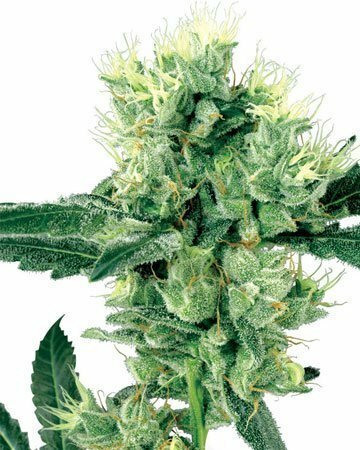 Quick to flower, awesome taste, and so mellow! 5 stars for sure. My small room set up has some limitations but with GCS autoflowering seeds I have no problems with my small space. Cynthia helped me pick out some strains of the Autoflowers and with my sleeping issues she suggesedt Blueberry. The seeds came with a few days of ordering. During the growing process I was a little worried about the size of the plants, I named one “Stumpy”. But after just about a month and a half I harvested about 14oz of sweet, sticky-icky. A few hits from my volcano and I am put into a very relaxing state. I will order again. I also tried this strain as a sleep aid and was happy with the results, not too much needed at all. Had a great yield. Like before no issues with the purchase or site, good stuff! These seeds didn’t grow very big, but it was still a pretty good harvest. All my seeds sprouted pretty fast, and I liked the affect of the buds – they help me fall asleep nights when I am having trouble, and it doesn’t take more than a hit or two.